In considering the use of 2cm thick porcelain pavers for raised flooring compared with conventional interior elevated flooring, the shock resistance of porcelain pavers is a factor that must always be taken into consideration (for example, when a hard object such as a hammer or other solid object weighing 4.5 kg is dropped from a height of 40 cm) – as specified under EN 12825. Despite the intrinsic density and stiffness of porcelain pavers, the slabs can nonetheless break or shatter if a heavy object is dropped onto them from a height. 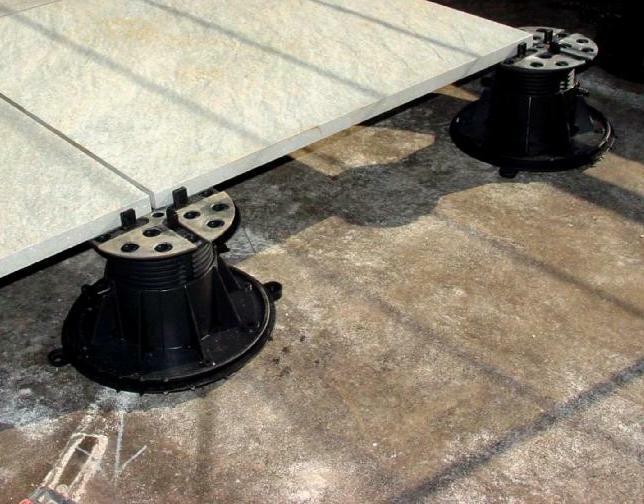 In consideration of the risk to anyone standing or walking on such slabs, in situations where hard and heavy objects are likely to be used or where floor heights are greater than 1.9 cm (3/4”), porcelain manufacturers recommend the application of a reinforcement to the underside of the slabs such as: – glued fiber protection – metal tray backing – overlapping metal tray. These applications do not increase the bearing capacity of the floor; they help limit the possibility of the paver from caving in if broken, thereby reducing the risk of injury. HDG can furnish porcelain pavers with factory-applied metal-backing. In addition, for porcelain paver installations on pedestals taller than 10 cm (4”), HDG offers several options that eliminate the liability risk which do not require this waiver. Please contact us to learn more about this option.